Security issues mean that up to 40 per cent children in some parts are not vaccinated. FORTY PER CENT of children in Pakistan and southern Afghanistan were unvaccinated against polio last year, according to new research. The findings, published in The Lancet, reveal that too few children have received sufficient doses of vaccine to with out polio in the region. Pakistan and Afghanistan are two of only three countries in the world where the disease has yet to be eliminated. Nigeria is the third. The research, undertaken by Imperial College London found that despite mass immunisations and the introduction of a more effective vaccine in Pakistan and Afghanistan in 2009, incidences of type 1 of the vaccine has increased. 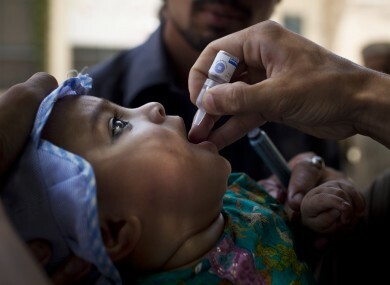 In 2011 polio cases in Pakistan were at the highest level in ten years. One of the reasons for the low vaccination coverage is access to all populations due to insecurity, in particular in some parts of Southern Region in Afghanistan, and Federally Administered Tribal Areas in Pakistan. These regions are a potential reservoir for the virus into polio-free countries, jeopardising worldwide polio eradication. The research found that there has been a substantial drop in vaccination coverage between 2006 and 2011 in areas where there is conflict. In contrast regions that are conflict free have achieved significant increases in population immunity. Email “Afghanistan and Pakistan a ‘potential reservoir’ for spreading polio”. Feedback on “Afghanistan and Pakistan a ‘potential reservoir’ for spreading polio”.